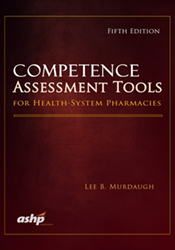 Since its original publication, Competence Assessment Tools for Health-System Pharmacies has continued to meet the changing needs of pharmacy directors and their staff. The fifth edition is a necessary addition to every pharmacy’s resources. In addition to helping pharmacy directors and staff provide more informed patient care and meet The Joint Commission accreditation standards, the new fifth edition gives you peace of mind that your pharmacy has access to the most up-to-date resources available. As with past editions, the fifth edition also includes a companion CD with PDF files of the competencies and MS Word documents of the job descriptions.